1) Assign without giving choice. This is a real worry with the Common Core. In our zeal to teach the required text types (narrative, informative/explanatory, opinion/argumentation), we forget all humans are motivated by choice. Can we include choice in our assignments even within the requirements? Of course we can. Let the students come up with their own twist on a topic, and/or have a Running Topics List where the class records issues that may be explored within these genres. These genres can and should be part of students' lives (and, hence, relevant). They shouldn't only experience them for school-ish assignments wherein all the parameters are dictated. 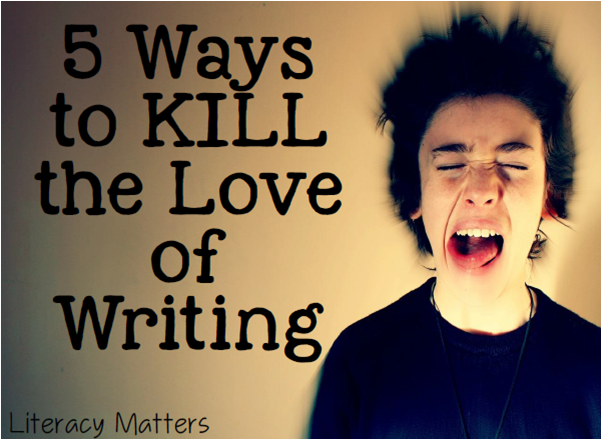 4) Keep the writing static. When students write for the sole purpose of completing classroom assignments, they don't experience the power of the pen and writing is not a very motivating endeavor. I love to design opportunities (or invite students to develop their own) that take the writing OUTSIDE OUR CLASSROOM WALLS! When our writing has a larger purpose, we feel larger ourselves. Can our opinions be shared with the powers that be: the company that made the product, the principal, the author of the book? Can our informational writing be shared with target audiences; people who may have a real interest/stake in what we've learned or discovered? Might our narratives be enjoyed beyond the scope of our classroom community? Real writers in the real world often come up with their own topics and decide which genre (out of many) best suits their purpose and intended audience. Thus, in school, if we want to produce real writers--writers who are empowered to write outside of school--we can't just make assignments, limit the genres students are exposed to, and limit choice. If we do, we are not helping our students develop the habits of mind writers need to be successful. P.S. I'm revisiting this post, almost two years later, thinking about what the next school year holds for my son who will be in third grade--the grade when the heavy "high-stakes" testing starts. I wrote a letter I plan to give to his teacher when school begins in the fall. If you're interested, you can view it here. It has a different vantage point on some of the same ideas in this post. Thank you for highlighting this issue so, it brought to my mind the story of a six year old who wrote a fabulous little story about babysitting. He got a failing grade because in his story the baby was 5 months old and he crawled around and did things that a five months old doesn't do! Sometimes adults get stuck up in trivial details and miss out on the essence, alas. How sad. You have to wonder what lasting effects such an experience may have on a fledgling writer. Plus...why is a six year old's writing getting a grade? Another point to think about. Thanks for sharing. I'd love to read his babysitting story!